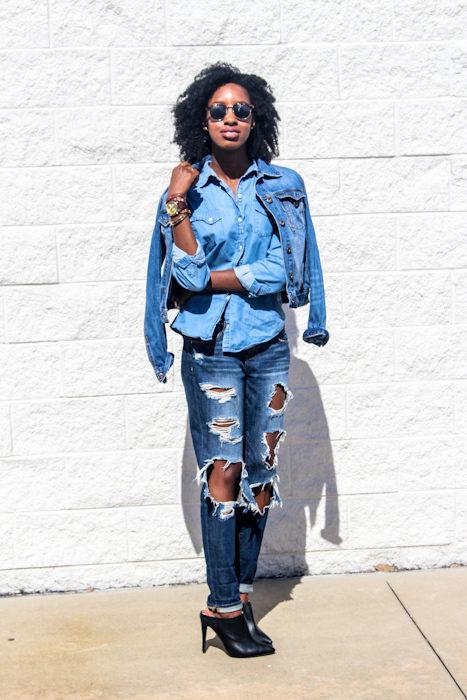 Make it a triple denim look by adding on an additional layer of denim. To add a final touch of denim it may be an additional layer such as a jean jacket, shirt or vest. Or maybe a small touch such as a denim bag, sneakers, or baseball cap. Change the entire look of a denim on denim entire by adding a cashmere cardigan, leather jacket, suede skirt, or satin blazer. Reach for something suede, leather, cashmere, silk, satin, wool,etc. Adding extreme textures to your look can change the entire appearance of your outfit. By accessories I mean scarves, shiny rings,bold bracelets, statements necklaces, funky heels, chic watches and more! Add em on , stack em on! Separate yourself from the crowd by adding unexpected touches and details to an on trend look. This is your chance to really show off your personality and style! Be it a great thrift find, or something with a feminine touch or maybe a pair of retro boots, go big or go home with the styling of this great trendy outfit.